If you were to buy theme or holiday table centerpieces, most likely you would find them to be very expensive especially if you order and have them delivered. Most are made with the same type of items including foliage of some sort (fresh, silk or dried), candles, ribbons and other craft items. Why buy centerpieces when you can easily make them yourself? Whether you are making holiday decorations, theme centerpieces for a particular event or you just want to make inexpensive, tall wedding centerpieces for that special day, use the ideas below to help you get started. I use these at every get together, strategically placed around the house. This first photo shows one of the holiday centerpieces I made using fresh flowers in deep Fall colors and my Grandma's highball glasses. This one is sitting on my Thanksgiving tablescape but I also made several others that year. Even had them in the bathrooms. In addition to using small vases all over the house, I like to place a decorative runner down the middle of the main table. 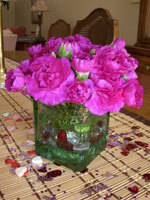 Then I create 3 vases of matching flowers; one large and two small. To make these smaller bouquets, cut the stems really short so all you can see are the blooms and no stems above the rim. It looks best when you use small, wide mouth vases, mugs, glasses or even candle holders like the one on the right. At a recent Valentines fondue dinner, I used a Bamboo Table Runner, placed flower arrangements down the middle (two small ones) and sprinkled confetti and candy on top to match my theme. All three vases had glass beads in the bottom that also matched the theme. What's nice about creating these smaller, matching bouquets, is that you can put them on the side tables also to really tie everything together. As holiday centerpieces go, these are so simple to make yet really beautiful. If you want to see my table for the fondue theme dinner I hosted, check out my Fondue Theme webpage. I snapped this photo at a wedding shower I attended. The idea can be adapted for really any occasion. The hostess made it by laying a beaded wreath on top of a cake plate, setting a water pitcher in the middle and loading it up with fresh, Spring flowers. You could get the same look by wrapping beaded garland around a vase. 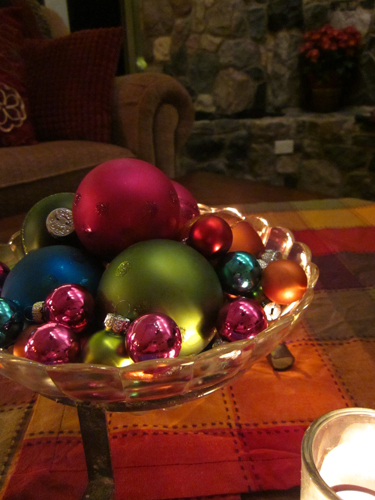 This holiday centerpiece idea is so versatile. You could easily change the color of the wreath and the flowers to match any theme. Visit our Christmas decoration page for natural decoration ideas, made with items from around your home like pine clippings, popcorn and paper. I was at a wedding recently and found so many ideas for floating candle centerpieces. The next two images were two of my favorites. They used the same items but just arranged them differently. The first one was placed on a table just outside the reception hall. Guests stopped here to pick up their seating assignments. They used a large glass container found at a craft store, filled it with clear glass stones and water and then floated white candles and the most beautiful, fully-opened pink roses on top. 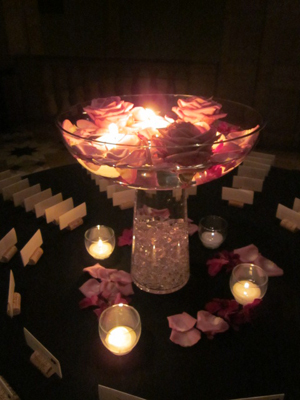 To finish off the look, they placed white votive candles underneath the large container and sprinkled rose petals in the water and on the table. It was just beautiful! The next one was one of 3 wedding table centerpieces they used on the dinner tables. This isn't a new idea but the color they chose matched their theme perfectly and made them extra special. 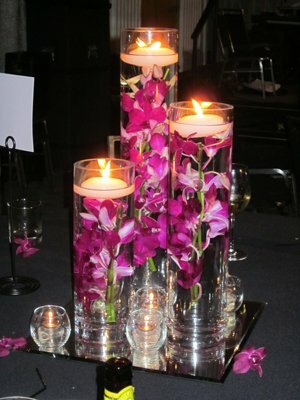 Between the fushia colored flowers, the votive candles surrounding them and the mirror they were sitting on, these centerpieces created the most romantic atmosphere. Perfect for a wedding but wouldn't these be perfect for a holiday or theme event at home? 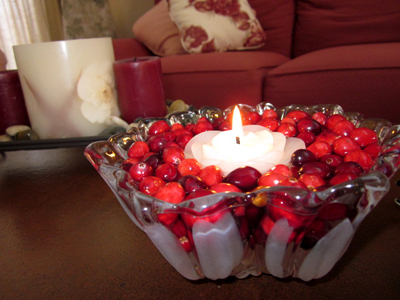 One of my all time favorite holiday table centerpieces is to create cranberry floating candle arrangements. You can do so many things with this idea. 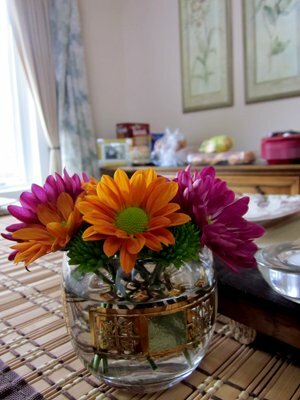 First, use what you have around the house, like hurricane vases and crystal bowls. Fill them three quarters of the way full with colored items, like fresh cranberries, glass beads or colored stones. Even fresh flowers and pine clippings. Top off with water then float lighted candles in the middle. These work so well for holiday table centerpieces and will last for a couple weeks. Find more photos of table centerpieces here. I do this almost every year. I have a set of ornaments in my favorite colors and I just love putting them in bowls and setting them around the house. Unfortunately I just moved and my favorite crystal bowl was chipped. I dug through my cabinets and found another bowl that would fit into this brass holder and I love it too! I did something different this year that makes all the difference. Just before my guests arrived, I lit 3 tea lights around the base of the ornament bowl. Look how they sparkle now! I think bowls of ornaments will be forever married to white tea light candles in my home. All kinds of decorative garland, like this beaded one, can be found at DecoratingStudio.com and craft stores like Michael's or Hobby Lobby. They come in every shade of the rainbow so you can easily match them to your party theme. Weave them down the middle of your dinner table or around your food items on your buffet tables. Add greenery if you like, then distribute white votive candles throughout the garland. I saw this on The Food Network and really loved the idea. 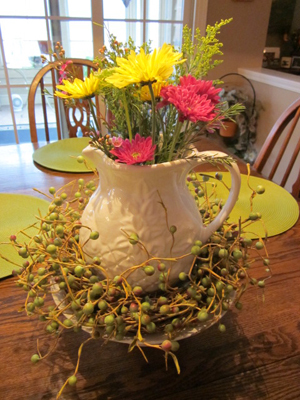 Take fresh greens, like pine garland, and run them down the middle of the table. Then among the greens place fresh fruit (pomegranates, limes, lemons, apples and grapes work well) and votives with white candles. Use unscented candles so that they don't compete with your food. Another holiday centerpiece idea is to use a chocolate fountain or a punch fountain on your main party table and then surround the bowl with fresh fruit and dippers for the chocolate. The dippers come in all sorts of color, shapes and sizes and create quite a beautiful display when all put together. 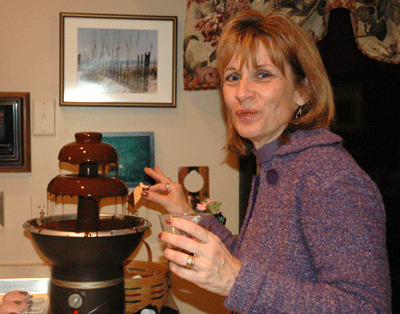 Strawberries, sugar wafer cookies, marshmallows, angel food cake and pretzels sticks are just a few of my favorite chocolate fountain and fondue dippers. Find Punch Fountains here and a good selection of Chocolate fountains and accessories here. Watch a video of Ina Garten, one of my favorite Food Network Stars, creating three Holiday Table Centerpieces using greenery, Christmas lights and fruit. And this video shows some very basic do it yourself centerpieces using greenery, candles and ribbon. A nice demo on how to make a bow too. Invitations - I use different kinds of invitations depending on how much time I have and what kind of party I am planning. You are sure to find at least one type of invitation here that will suit your needs. Party Decoration - Depending on the type of party you are having, I have found that you can either go nuts with the party decorations or you can really keep it simple and still show off your home with subtle, classy style. Either way, you'll find great Christmas party ideas here for how to do it right. Party Recipes - Ah...recipes. My favorite part of party planning. I've gathered some of my favorite party recipes for you that are sure to delight all of your guests. 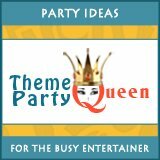 I am not called the Theme Party Queen for nothing! Party Music - This is my husband's area of expertise. In my opinion, the party music sets the tone for the whole evening. Have you ever been to a party where the music really didn't fit the theme or the age of the crowd? It's really kind of a downer. Compare that to a party where the music is well thought out and never ending. The party is in full swing the whole night! Find some suggestions here on how to do it right. Costumes & Attire - This section has ideas ranging from full blown party costumes, like dressing up in a Santa suit, to the more subtle things that you can add to your attire, like wearing a funny T-shirt or hat. Find lots of great ideas here. Fun Party Games - This selection of Christmas party games includes options for all age groups. Some are perfect for kids holiday school parties while others work well for large adult parties at home and office.